Often what we see as out of place or unwanted, God sees as beautiful and good! Who or what is the weed in your life? The weeds in my life are often people that press my ego’s buttons! They annoy me, insult me, or hurt me! I feel like they are ruining the beauty of my life’s lawn… I want to pluck them right out and toss them in a bag to the curb! 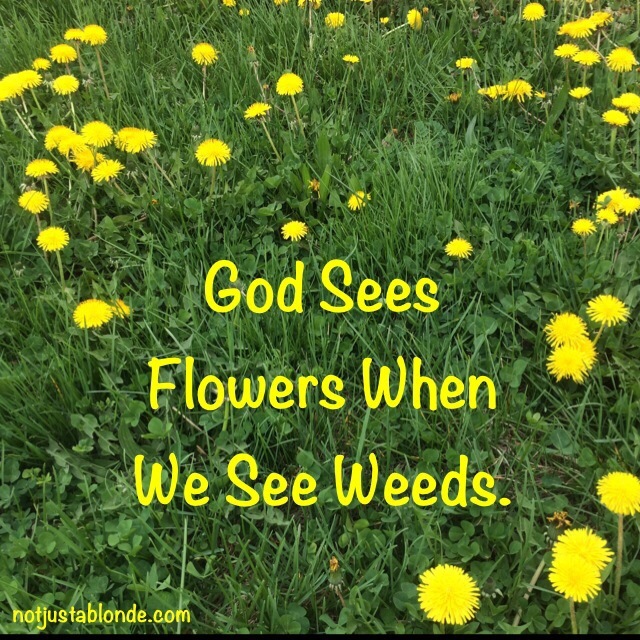 Yet… these weeds are often people God has placed in my path for a reason. He wants me to learn tolerance, forgiveness, humbleness and… to learn to see the lovability of others as He sees what’s lovable in me! Often it’s just a matter of perspective… stepping back and looking at the beauty in the big picture. It’s a matter of understanding that sometimes our biggest blessings are flowers that look like weeds. We can finally see their beauty if we let go of our earthly perspective and take a look through the eyes of God. Amen! Give me Your eyes God! That’s quite often how I see people. Only people define certain flowers as weeds, and it is because they grow and may swamp those that people define as desirable. Some of the most attractive flowers in their native habitat can become a nuisance if they are grown in a garden, because they propagate too quickly. God put the possibility of all the flowers that we know in that first lifeform that He created, and He knew that we would curse them, or love them, according to our perspective. Yes, and often the earthly perspective looks at the present, or foreseen, future and fails to see what might happen as a result of actions taken. Some rich and middle class people in England in the 19th century planted flowers from distant countries in their gardens and some of these have now become rampant in the countryside at the expense of some native species. Still, God allowed this to happen, because He has His own purposes, and one of these imported species has now formed corridors for insects to pass along, with their food supplies always present. What we have lost in flowers, we have gained in butterflies.